I am a new NANFA member and am excited to be in a community with other like minded individuals. I am from Nebraska originally but have been in north central Kansas for the last 10 years. I am an enthusiastic about fishing, aquariums, and conservation. 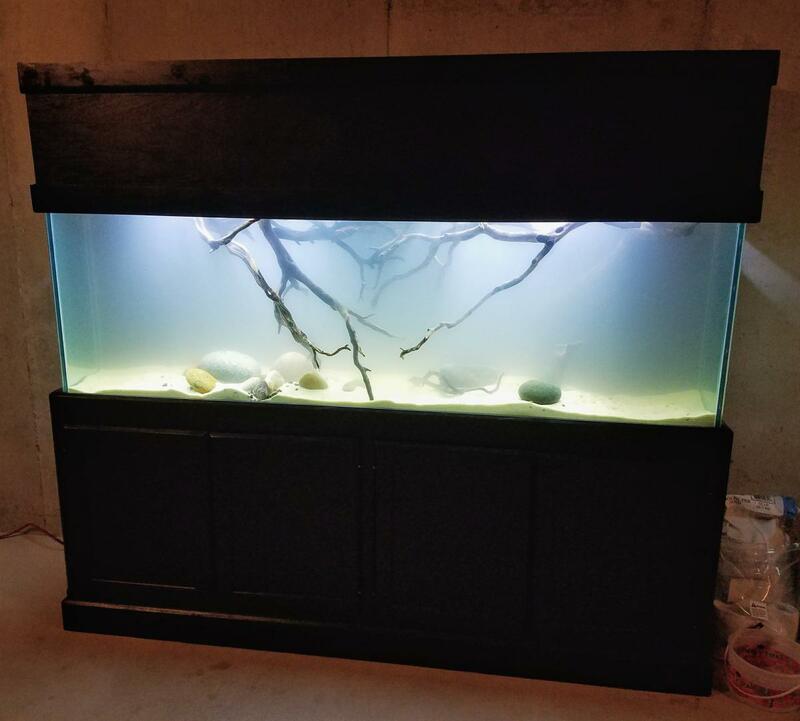 I having been keeping and breeding Central and South American cichlids for the last 12 years, we have recently moved into a new home, and I am converting my 135g (72" x 24" x 25") into native tank which will go into my basement office/den/man-cave once it is finished. 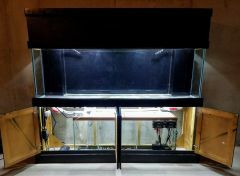 I plan to stock a few Longear, Orange-spotted, Bluegill and other sunfish species, as well as a yellow or black Bullhead. Dealing with CA and SA cichlids, I know all about aggression and territorial disputes in aquaria am hoping the tank will be large enough and aquascaped in such a way to deter aggression, but please let me know if I am setting myself (and fish) up for failure. The 135g display tank is filtered by a 55g sump. 2x 100 Micron large filter socks will provide mechanical filtration, and 6 gallons of fluidized K1 bio-media will provide biological filtration. The sump is powered by 2 Jebao DCP 6500 marine pumps, which I plan on running around 50% to provide roughly 1000gph turnover. I am looking forward to collecting once it warms up, I have fished for sport my whole life and the idea of merging my two favorite hobbies should have dawned on me earlier I have read up on the regulation for Kansas, and I have a few collection points in mind. I was looking forward to trying to catch Longears at Geary Co State Fishing Lake but then I discovered it was a Aquatic Nuisance Species body of water, and fish cannot be transported from it alive. Bullheads will limit your options some if you are wanting diversity. Eventually they'll get big enough to eat everything but your larger Lepomis. You might consider madtoms as an alternative if you're wanting more variety such as larger shiners or topminnows. Thanks, I have been looking through the pocket guide to Kansas stream fishes, I will check out the other one. I definitely wouldn't put darters in there with your planned stock list. Like Michael said, some larger minnows could work. If they get eaten from time to time, just replenish as needed. The sunnies and cats would make a good display tank by themselves. How do madtoms do with bullheads and Lepomis? Do bullheads display conspecific aggression toward madtoms? I personally have never had any issues keeping adult madtoms with various Lepomis species. I have kept them with bantams, orangespots, longear, bluegill and smaller warmouth without fatalities. I would not be comfortable mixing bullheads and madtoms together. I think the bullheads would eventually outgrow and eat them but have never tried it to find out. I am really hoping to get the plumbing from the 135g to the 55g finished this weekend and get it filled and start cycling. Every time I have some time carved out to work on it, something pulls me away. I will post some pictures of my setup once it is running. I am setting it up in a different part of the basement while I finish my office. I am not going to put in any substrate or aquascaping until after it is moved to its permanent location. No leaks, added pool filter sand and driftwood and some river rock's. The pool filter sand I got was from Menards, I had purchased PFS in the past from a pool supply store and it was much cleaner and didn't require rinsing. As you can tell from the pictures this clouded things up a quite a bit. When the dust settles I'll add more river rock, small stones and pea gravel to make the aquascape more natural. Big tank envy, or catching little fish overcompensating??? I just added some more pea gravel and river rock, going to venture to a local creek and try to find some large stones to add to create more nooks and caves so the little natives I (hopefully) catch this spring have a fighting chance and aren't just waiting to become feeders. I seeded the sump with some ceramic media that has been sitting in a canister filter for about 7 months from a previous tank, don't know if it will hasten the cycling but some of the K1 media has gone from floating to suspended, so fingers crossed. Funny you should mention this, I placed some orders to TenkaraBum and Amazon for some tiny hooks, level line, tippet connectors, tenkara rod, along with a collapsible ultralight spinning rod yesterday, so I should be well equipped to catch the smallest sunfish as well as micros. A thread documenting my ineptitude is sure to follow.